I KNEW IT! I may have to get an army of kittens trained in the art of clicking to help me next year! I believe its time to take away SPB honey and add it to the New horizon tea. We are just about to release an exclusive interview between the instruments of SOHO and Ms. Sun herself. OK SOHO for everyone 5 for SPB I sent one to you. Anyone seen a trophy of certificate for winning this thing? 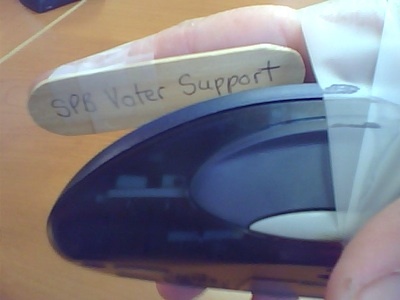 I’m a SPB supporter…. but to be fair (and i’ve done this consistently), I’m voting for SPB and SOHO. Too funny! The results are completely unpredictable. I think the ghost of the Apollo gantry is influencing the vote. SPB rocks!!! The have throughout the entire tournament. The fact that they are even supporting SOHO now shows it. I am a SOHO fan and for every SOHO vote, I also vote SPB. In all fairness, I also like LRO and New Horizon. Great Semi-Final. NASA Edge, outstanding job done with this. This is really weird, I’ve never heard much about the SPB, and as such never expected it to make it as far as it’s gone. What IS going on? Are these people organized or something? To Guest #8…You bet your helium dewar we’re organized! SPB and the balloon program are not only a cult; we are a closely knit family. Albeit a sort of small internal family but with a huge extended family. And family takes care of family. I’ve only been with the program for five years and am constantly amazed by the types of science that has been performed on those “silver pumpkins”. Granted, I am also humbled by all the other science being done by NASA that, when I was a “civilian”, I never imagined. This contest has been awesome in that I actually checked out the INFO on each contestant and am proud of each and every one of the missions that were done, are in progress, or are planned. And I encouraged everyone I know to check it out and vote for their favorites (hopefully us), too. Romeo (love the name…you single? )– SPBers have been voting for other missions as well as our own. I had hoped that the Apollo(s) would have made it through since some of our group worked on one or more of those missions at one time. When the dust and the OMG voting issues/whining settle, I too feel that this has been a blast. It has engaged not only NASA employees but people around the globe. I had never known about NASA EDGE, but you can bet your parachute I’ll be checking in on the program from now on. I’ve found SOHO a very interesting and worthwhile program. This SPB supporter and spouse has voted for SOHO in this and several past rounds. We’ve voted for several other missions in the past too. I am sure SPB generals are mobilizing reserves and a full assault will begin shortly. The SPB team has finished their morning coffee and it is time to get serious about the “work” that needs done around here. Stand by for max inflation! Thanks for your votes Paul F! SPB appreciates them! I think what poster #12 means, is people are not voting JUST to see a particular mission WIN, instead they are also voting to see certain missions LOSE. We do NOT mind how many times our competitors vote. BRING IN ON! THX TO ALL THE SPB VOTERS! I am a one of the very enthusiastic SPB voters. Everyone seems to be blaming SPB for ruining this whole tournament, and making it into something that it was not intended to be (to find the best NASA mission). I think if you asked SPB voters if they thought SPB was the greatest NASA mission ever, most would agree that it is not. Although SPB has done some of the most meaningful science of any NASA mission, nothing can compare to the historical significance of Apollo 11, Apollo 13 or even Gemini. Those missions (and probably a couple of others on the list) go way above being paramount in NASA’s history, and reach into the realm of being some of the most important and significant events in AMERICAN (and human) history. Now that that is clear, it was not SPB supporters who took out any of these giants – that was left up to other missions and their supporters. Coincidentally, 3 of these “giant” slayers are in the final four with SPB. LRO, SOHO and New Horizons took out Apollo 11, Vikings I & II, and Gemini IV respectively. P.S. Is it midnight yet? My wrist is getting sore. SPB People!!! Where is the SOHO love?!?! SOHO is 600 points behind LRO and so much more fun to face in the Final. To Little SDO HMI (#17)…This SPBer has been voting for you. Some of our own payloads are involved in solar research. Would be quite an interesting final matchup! You SPB people are probably the same people who voted for Colbert. The whole point of NASA Mission Madness was for the public to decide on their own which was the most significant mission in NASA history. Now a balloon that is a speck in the grand scheme of things is no doubt going to win. Democracy eh? What if that mob of people are a bunch of idiots who have no real appropriation for anything except their own amusement? There is a reason democracy by it self is a dangerous thing, and why we live in a Republic. Now, that is just wrong..LOL..
SOHO is 18votes behind. Keep Clicking!!.. *looks for my secrect safety pin stash* just in case SPB get’s close to the finish line. What is the superpressure balloon? How does it work? “It’s so funny, by the way, one vote for SPB. Glory SPB people.